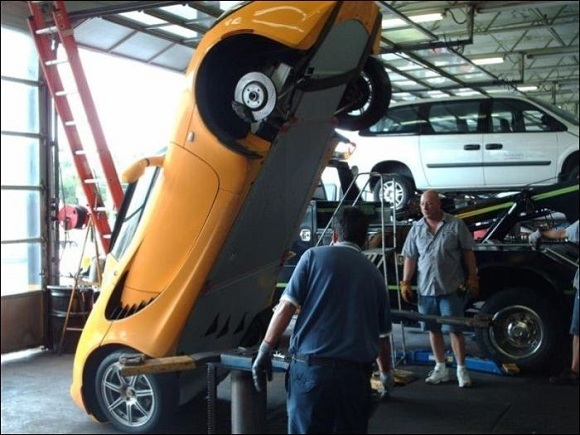 Modified 2008 Lotus Elise falls off of a mechanic shop lift and gets pinned standing up. Car Fail. 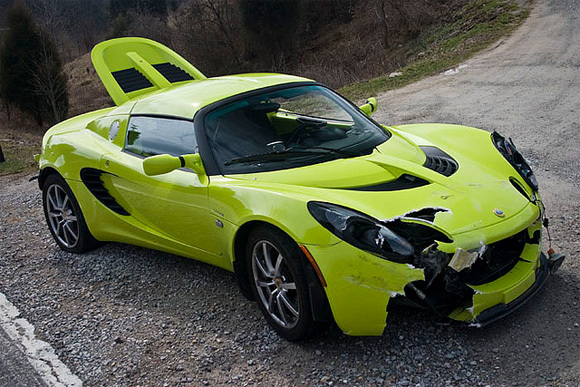 Not sure what happened to this 2008 Lotus Elise but it looks like its going to need a lot of repair. 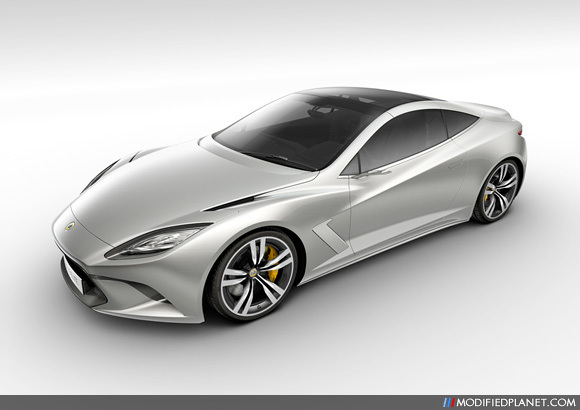 Check out the preliminary car photos of the upcoming 2014 Lotus Elite. The 2014 Lotus Elite features a front-mid positioned 5.0 liter V8 engine that produces 620 horsepower and 720 ft-lbs of torque. Options include a slick retractable hard top version and the optional use of hybrid power technology. Mean front car photo of the 2005 Lotus Sport Exige F that puts down 400 horsepower and 294 ft-lbs of torque to the rear wheels. 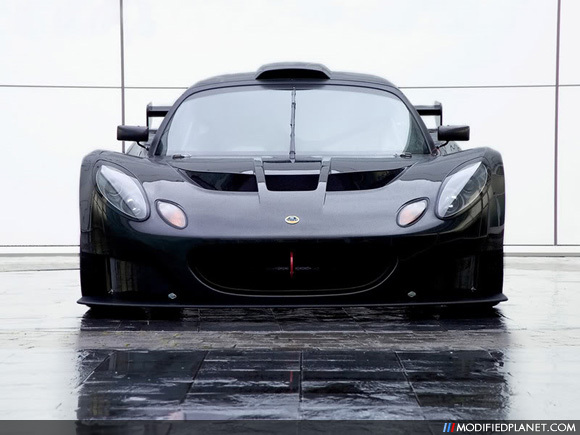 What do you get when you widen and reinforce a 2010 Lotus Elise and stuff it with a supercharged 6.2-liter LS9 V8? You get the insane Hennessey Venom GT with a choice of one of three power levels. The “base” version pumps out 725 horsepower and 741 pound-feet of torque at 3,200 rpm running on 91 octane fuel. The second available tune offers a twin-turbocharged engine that puts out 1,000 horsepower and 900 lb-ft of torque running on 93-octane fuel. The third and most powerful available tune outputs 1,200 horsepower and 1,100 lb-ft of torque running on 109-octane fuel for those people who require constant production of adrenaline to live. For a mere $600,000+, you too can own one and be the envy of your millionaire friends. 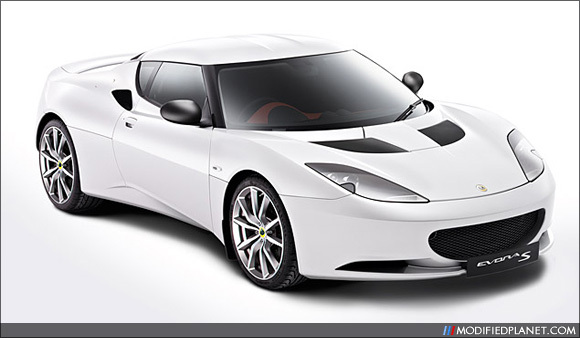 Lotus decided their Evora wasn’t quite cool enough so they took the regular Evora, modified it and added the S designation. The new Lotus Evora S has been beefed up significantly with a mid-mounted, 345 hp 3.5L Toyota V6 that provides a zero to 60 time of just 4.8 seconds and a top speed of 172 mph. Power features include a sport button that gives the driver more control over the throttle response, stability control settings, a higher rev limiter and an exhaust bypass valve. Suspension upgrades include Eibach springs, Bilstein dampers, a forged aluminum double-wishbone suspension, 18-inch front wheels and 19-inch rear wheels. Last but not least, the Lotus Evora S has an interior that boasts an Alpine-branded media system with a 7-inch touchscreen, Bluetooth, iPod connectivity and video playback. All we have to say is wow.